This is one of those personal entries that I’ve been debating about writing for quite a while now. After last night’s doubles hooping class, I thought it was the right time to put this out there. I have bipolar II disorder and attention deficit disorder. There. I said it. I’m generally pretty open about my mental illness, but for some reason, I was hesitant to open up about it here. Here’s what those term mean on very basic levels. With bipolar II, I don’t get the really high “highs” associated with bipolar I, I get little “highs” and really low lows. It most affects my mood. The ADD makes my mind race, makes it a little harder for me to focus on boring stuff, and makes certain concepts and tasks harder for me to learn. It also give me a tendency to mix up stuff, like lefts and rights. This made marching band a lot of fun. Now, I am under the care of two excellent people who make sure I’m stable and well-adjusted. I have my wonderful therapist who helps me talk things out, and my fantastic psychiatrist who keeps me on the right path with working medication and health monitoring. That being said, I am usually pretty stable. I take my medication every day and do things, like hooping, to lift my mood and keep my mind active with something that makes me feel good. I get my eight hours of sleep and try to take time out of the day to do things for myself. No amount of medication and self-care is going to work 100 percent of the time. My psychiatrist told me this sage piece of wisdom. I’m still going to have ups and downs. Yesterday was a bit of one those downs. 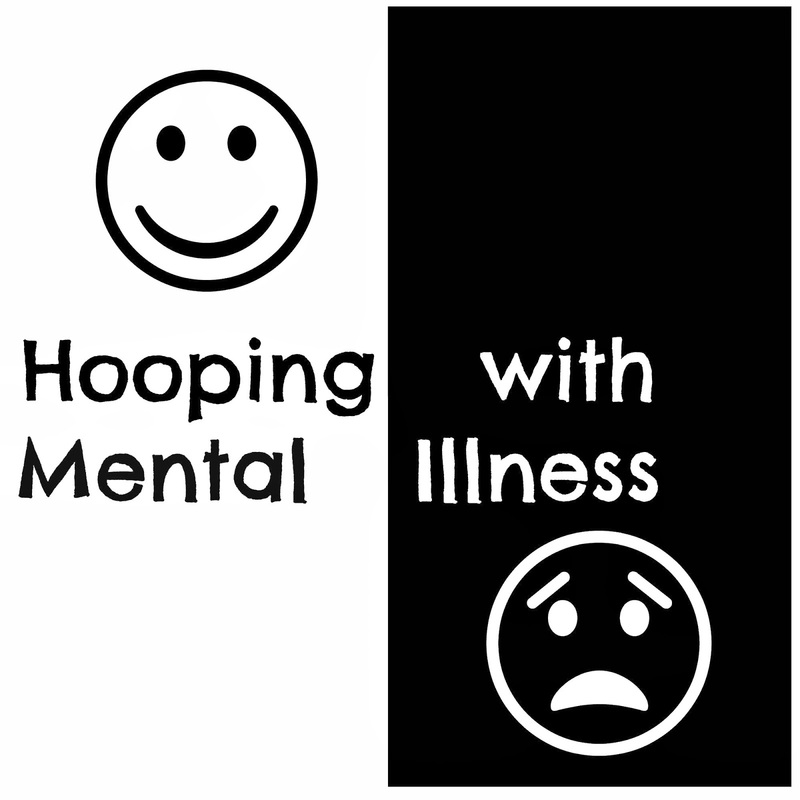 Here’s what hooping with mental illness is like. It makes me soar higher than eagle when I get something either the first time or master the move. It makes me want to cry when I need special help or a move just eludes me. Granted, we all have our hooping nemeses. Last night, I met one of mine: the corkscrew. Most people would have gotten the move within a few minutes. The others in the class did. It took me about 20 minutes, and I was so frustrated I wanted drop my hoops, and go into a corner and cry. You may be saying, Jenn, that unreasonable. I know it is, but I’m telling you how it FEELS to me. Emotions are amplified me. Both disorders increase my emotional sensitivity to many situations. I know I will get the move. I just need practice and to keep my determination up. Ok, enough with the negative. Hooping has done so much GOOD for. Both of my caretakers give my mad props for doing this. It’s exercise. Exercise produces endorphins that act as natural antidepressants and lift my mood. If I’m at home and I feel crappy, I try to hoop for a few minutes. Boom. I’m feeling better. Hooping forces me to focus and concentrate. It keeps my mind on a certain tasks and what I learn from hooping like that translates into my work. I get a sense of accomplishment from hooping, and this boosts my self-esteem. Who doesn’t need that every now and again? As those around me know, I am hooked on hooping. It has given me so much more than I could have imagined. The benefits I listed are only a few. I know I will have more frustrations that will make me want to sob uncontrollably, but that’s ok. I will get past it and move on. I could also go much deeper into the negative, too, but I don’t want to do that. I want to end on a happy note. Mood disorders, or any mental disorder, is a chemical imbalance, to put it lightly. I try to remember that when I feel bad. And I’m working to help to improve upon myself and overcome my obstacle. I’ll never be free of both disorders, but I can certainly lessen their effects and my hold on my life. Hooping has given me a little bit of that control back. Hi, my name is Lori. I am not a hooper yet, I don't even know how to keep a hoop going around my waist. It looks like fun though! I was wary of starting to try because I have bi polar disorder and new things are frustrating for me sometimes. But you just gave me some encouragement! Thanks!